Beautiful pine needle basket. Came very fast and in great shape. Very pleased with purchase. This a truly beautifully made basket. A real work of art. I love the size. Colors, especially with blue stone, are beautiful! Packaged securely. Shipped quickly. One stitch and one pine needle at a time turn thousands of pine needles into a unique artistic creation. 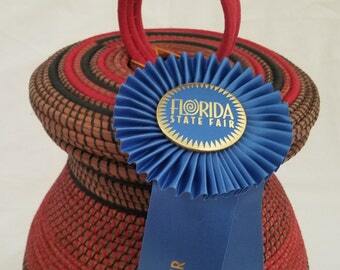 Teri has been awarded multiple ribbons for her artistic pieces and was awarded 1st place at Florida State Fair. Teri collects pine needles from her own backyard as they freshly fall. She gets excited about approaching storms. With hand selected pine needles Teri hand stitches a continuous coil until the basket is completed. In 2001, Teri Thompson discovered an artist making baskets out of 18 inch long pine needles. She expressed, “Oh my, you have to teach me”. After he gave her a 4 hour lesson, she was hooked. She researched books and began making baskets of her own. When she would get stuck as to what was the next step, her teacher helped her perfect her craft. She practiced on her own until she developed her own unique style. Today, Teri collects pine needles from her own backyard as they freshly fall. She gets excited about approaching storms that causes new needles to drop from the trees. With hand selected pine needles she hand stitches a continuous coil until the basket is completed. One stitch and one pine needle at a time turn thousands of pine needles into a unique artistic creation. Teri embellishes her baskets with natural accents such as, wood, nuts and stones making them even more unique to her style. These Native American art forms evolve from Mother Earth and will last for generations to come. The Florida Seminole Native Americans were one of the first tribes to make pine needle baskets in the 1860’s. They used a sharp piece of sea shell or bone as a needle. Some of the baskets were used to carry water, winnowing seeds, and feed baskets. Raffia and sinew were used to sew the baskets. Today, the ‘lost art’ of pine needle basketry is still being revived by a few creative people and recognized as an important part of Florida heritage. Teri is keeping the art alive with color and inspiration and creates her baskets with the same materials used by the Seminoles – pine needles and sinew. Teri has been featured in several newspaper articles and appeared on television representing Pine Needle Art for upcoming Gasparilla, Winter Park, and Main Sail Art Shows. In addition to art display and sales at the Tampa Bay History Center, she demonstrates Florida heritage at the Florida State Fair Cracker Country. Teri has been awarded multiple ribbons for her artistic pieces and was awarded 1st place at Florida State Fair. Teri continues to participate in art shows to share her passion for the lost art of pine needle basket making. One stitch and one needle at a time, Teri turns thousands of pine needles into a unique artistic creation. Teri embellishes her pine needle baskets with natural accents such as, wood, nuts and stones making them even more unique to her style.